Over the holidays, I was hanging out at Sarina + Tim's house + decided to shuffle through Tim's ever-expanding vinyl collection. I had come across the Perfume Genius' Too Bright + noticed it had something attached to it that said Vinyl Me, Please - including a recipe for a cocktail. Obviously, being the nosy midget I am, I picked Tim's brain about the company. Lo and behold, I learned that Vinyl Me, Please is a record subscription service. 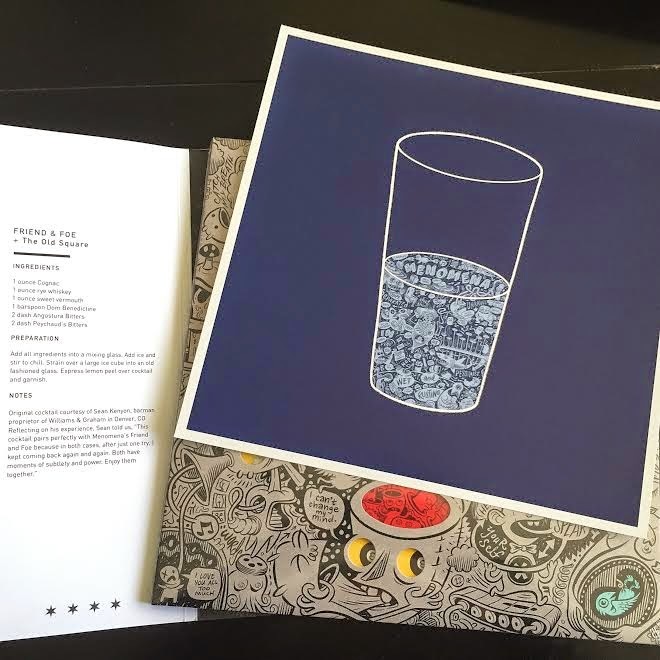 Each month, subscribers are sent a record, which is carefully chosen by their music loving staff, along with a plethora of other goodies [an original art print - which looks killer in a record frame, a custom cocktail recipe, plus a slew of other perks only available to members]. I knew I needed to look further into this, so I sent an email to the powers that be, which led to a solid phone chat with co-founder Tyler Barstow about music, Long Island + the direction he saw VMP going in. After learning more about the company, I decided that I needed to get my hands on the next release. April arrived + soon enough, so did my surprise from Vinyl Me, Please. April's Record of the Month just so happened to be Menomena's 2007 release, Friend & Foe. I was like a kid in a candy store + opened the box as fast as my little hands could. Wow. This was way cooler than I had anticipated + photos don't even do the art justice. The album has a six panel gatefold cover, with cut outs on the front. You can spin a disc of art on the cover, which changes the faces + shows the track listing. Genius, I tell you. The art print included is also really nice - I feel like I could hang it in any room of the house [pretty sure I'm going to put it in the kitchen or bathroom when I move into my new place at the end of the summer]. As for the drink, The Old Square, I have yet to drink it because I've been battling a killer sinus infection, but next week I will be heading over to Swallow in Huntington Village to snag one! Oh, as for the music? Its awesome. I was worried that I wouldn't enjoy the selection, but its a solid album start to finish. The dudes at Vinyl Me, Please know whats up. While I was on the phone with Tyler, we decided that a contest would be really rad. I haven't done one in ages + they had yet to participate in a contest, so it was perfect! I've had to keep this a secret for MONTHS, so I'm stoked that we can get this started. Scroll down to get the details. I'm all about random acts of kindness, so this is a random act of vinyl. The prize is a three month subscription to Vinyl Me, Please [valued at $75]. What do you have to do to enter? Just comment once below with a band//album//song that you really dig that you think we [me, fellow readers of the blog + the dudes at VMP] should check out. Super simple, but hella informative for everyone involved. Now, for those of you who know me, I always want to do a little more. We decided to give away TWO subscriptions, not just one. One winner will be chosen from the blog, but we will also be choosing another winner from Instagram as well. 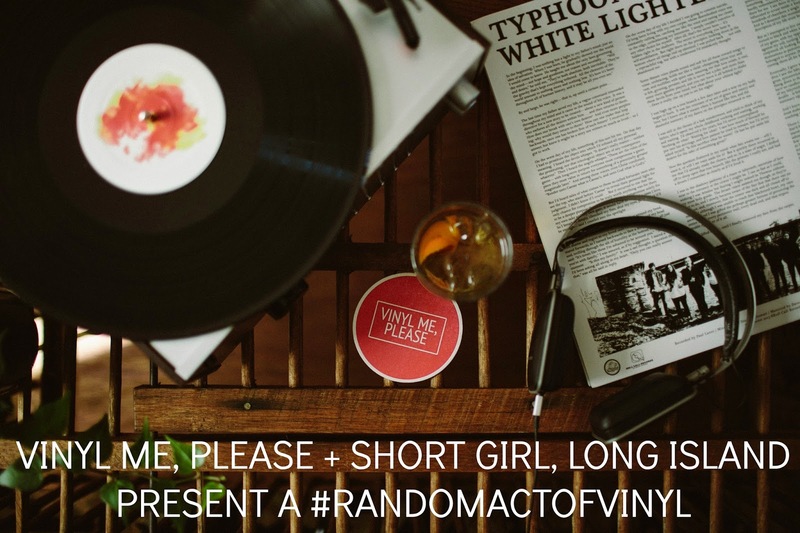 All you need to do for the Instagram contest is follow @VinylMePlease + repost the photo below with the hashtag #RandomActOfVinyl. You can enter on Instagram as many times as you'd like. The contest starts today + ends at 11:59p EST on Friday, May 8, 2015. Winners will be chosen the following day + contacted within 24 hours after the contest ends. Glad you got such an incredible record to begin with; "Friend and Foe" is great, especially the track "Rotten Hell". Great art, awesome music. 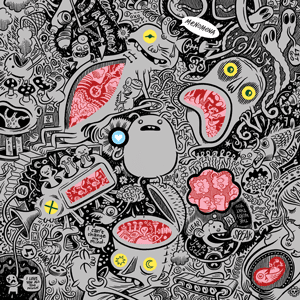 I'd love to recommend to you this album that actually just came out by the Danish band Mew, it's called "+-" . They play the best dreamy, summery and somehow challenging pop music you've never heard. Or maybe you have if you've been in my company long enough. Pianos Become the Teeth // Keep You // "Repine"
Cool! I love vinyl and visit the few remaining record stores. To hear the beginning of rock 'n roll, get "Here's Little Richard," his first album (1957) with 28 minutes of fabulous music. Crippled Black Phoenix "We're Almost Home" and Mogwai "Burn Girl Prom Queen"
Not sure if my last comment went through but...Courtney Barnett's album "Sometimes I Sit and Think, and Sometimes I Just Sit" is pure magic. Poppy, grunge-y, and damn wonderful. There's an honesty and specificity to her lyrics that are so refreshing. Check it out! The album "Take A Vacation!" by The Young Veins. Their best and only album. This ex-Long Islander has been jamming between Janelle Monáe//Yoga and Jidenna//Classic Man, both from the (almost here) album “Wondaland Presents: The Eephus”! Hoping they’ll press some vinyl! Thanks for asking!! The Jakes EP "shake my hand". The guys are now in young the giant, but I love this early material! Lately I've been into a band called Land of Talk. Short-lived indie rock band led by a woman with a fluttery voice and mezmerizing melodies. Has the indie charm with an extra crunch in the guitars. The album: Some Are Lakes. Standout track: It's Okay. ...And You Will Know Us by the Trail of Dead- Worlds Apart- Will You Smile Again? Just saw him last weekend and he managed to get Seattle dancin'! Odessa // Odessa // "Hummed Low"
One of the best instrumental albums from Madlib! Anything at all by Helio Sequence but in particular I feel a need to mention "Repeater"
Quiet Hounds - Hemlock. All their albums are great. Ivory &Ash/God Bless Your Bloody Ears/God Bless Your Bloody Ears (though the whole thing is awesome). Been hearing nothing but good things about Vinyl Me, Please lately so this is awesome. I'd suggest the song The Marriage of Coyote Woman by All Them Witches from their record Lighting At The Door. Their catalog is tragically slept on. 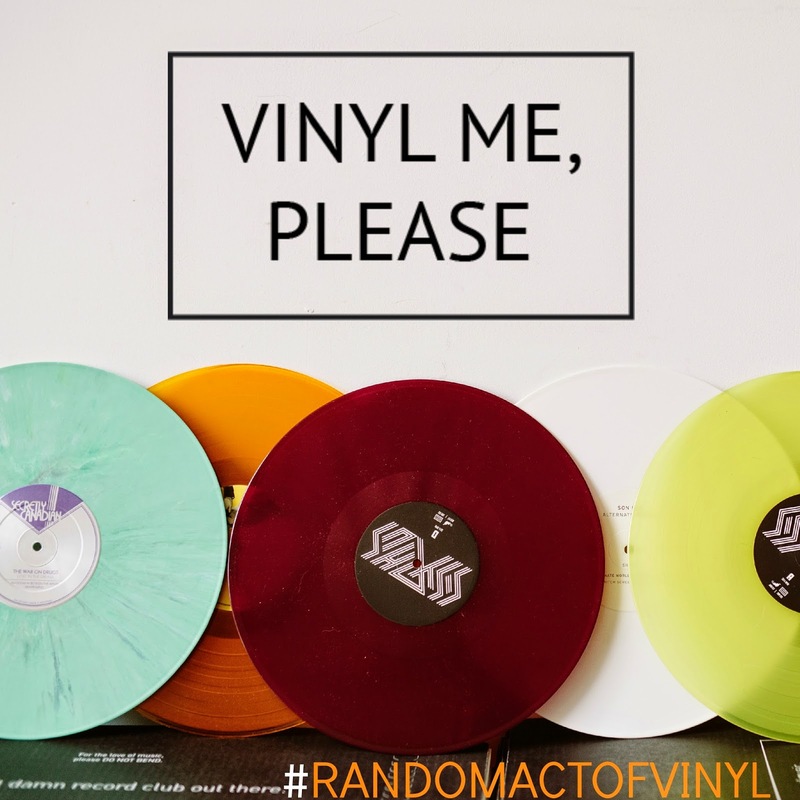 I'd love a Vinyl Me, Please subscription. Great company! Sound and Color by Alabama Shakes--they are an amazing band and wonderful people! This is their second album they just released and I expect many great things from them in the future. You guys should check out Man or Astro-Man . They play garage surf rock with a lot of sci-fi thrown in there. Well I hope I win, I would really love to expand my library. It's not that big but this would help out a lot!!!! Lower Dens - Eacape from Evil - "To Die in L.A."
*But the whole album is dang good! Nigel & The Dropout - "Tumultuous"
A really cool, fun and enjoyable Indie Rock band with Electronic flares throughout. Below I've attached a link to their bandcamp page, I definitely think these guys need a listen to because they do some interesting things while also having fun and enjoyable music. Good luck with the competition to everyone and thank you all for the recommendations. The Leon Bridges "Coming Home" LP is amazing. Would love to see a collab with VMP for the release of the full EP in June. Have you heard Beach Slang? Feat. members of power pop punk group Weston. Kinda like pre-major label Goo Goo Dolls (pre-schmaltz era). They just signed to Polyvinyl & have two EPs out. Lucy Rose has a new one coming out soon, she's absolutely worth knowing!! So this insanely attractive girl recommended I check out a band called Moon King, specifically the album Secret Life. It rules, super unique and refreshing. My favorite song is called "Impossible". Check it out. You'll like it. Sooooo Incubus is my AbsoFreakingLute favorite band. but I do looooove so much more music as well. I'm super excited to say that Incubus is touring again and working on a new album. Although they're first EP for the new album doesn't drop until May 12th, they've already released 2 songs from that EP [Trust Fall (Side A.)] I personally think everyone should listen to all Incubus haha, but just give a listen to the Song 'Trust Fall' for now. I'm sure everyone is already aware of Incubus, as it is more mainstream than other comments. but still! check out the new music. It would be so AWESOME if VMP featured they're new album as a Vinyl Of the Month!! I'd have to go with "O" by Damien Rice. That's one I'd really like to hear on vinyl. Hiatus Kaiyote is an incredible band that mixes jazz, soul, and electronic together to make something most people have never listened to before. Highly recommend checking out their latest album.